I seriously want one of these. May be in the near future. It is not often in our lives when artists, musicians, poets and writers touch us in such a profound way as to shape us for our days to come. This past week I read on several blogs and book outlets about the passing of Brian Jacques, the author of the Redwall series of books. I personally have not actually read a Redwall book in probably fifteen years, with the last one probably during my junior high days. For some reason though this pronouncement touched me in a very profound way. I first found the Redwall books when I was in grade school when I saw Salamandastron in the Scholastic book catalog, that I presume all school children are familiar with. This was my first introduction to the Redwall series and if I remember correctly, one of my first introductions to a full novel as well. I was instantly taken to the book as its stories played out the adventures of the noble badgers in the mountain, their leader and a weasel assassin. I quickly fell in love with the series and after that read several more of the books. Over time though I outgrew the books, mostly because of my immaturity in assuming I was too mature for them. They always had a place though in my favorite’s list and I often found myself recommending them to some of the most unlikely of people. Just six months ago I actually recommended Salamandastron to a coworker of forty. A blog post on Tor.com though this morning hit home though when I read about how the author discovered and ingested the Redwall series of books. As I read comments on the blog post, almost all of the stories were so similar to my own. Young boys in grade school discovering a series of books about adventure, intrigue, honor, friendship and to some extent war. It is perhaps the perfect mold for a young boy in many ways and it certainly solidified my love of fantasy on the whole. 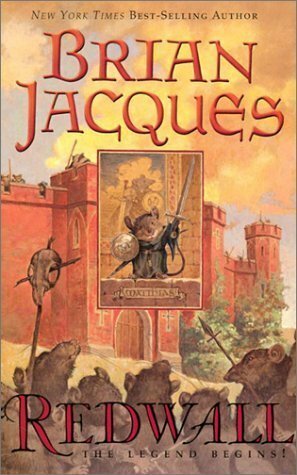 I often remark on how Brian Jacques does not get his due credit as being one of the best young adult authors of his time. He touches on so many relatable subjects for the young male reader and in a world where young adult books are increasingly being catered towards the female crowd, young boys need something they can identify with. As I mentioned before, these books in some way changed me as a child and shaped my tastes and personalities and it has taken perhaps years to fully realize how something that I read when I was twelve could do so. If you have not read any of the Redwall series before I highly encourage you to do so, and if you happen to be a parent I encourage you to share these books with your children. Information is like water. It will find the cracks and seep it&#8217;s way through. Information is like water. It will find the cracks and seep it’s way through.